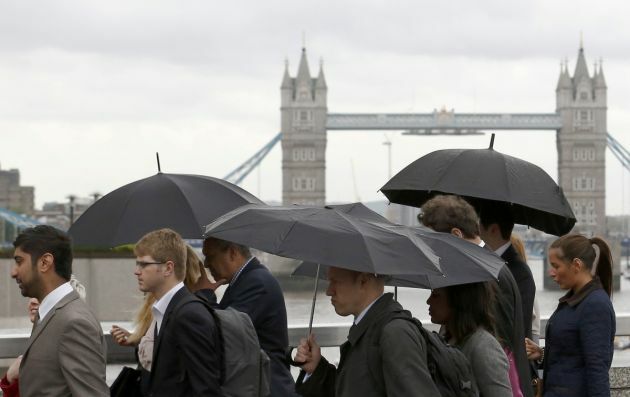 (Photo: REUTERS / Luke MacGregor)Pedestrians cross London Bridge during the commute to work in the City of London June 22, 2012. Ratings agency Moody's downgraded 15 of the world's biggest banks on Thursday, lowering credit ratings by one to three notches to reflect the risk of losses they face from volatile capital markets activities, but banks criticized the move as backward looking. Anglican, Methodist and Presbyterian churches in England, Scotland and Wales have joined to form a credit union offering an alternative lending scheme that the financial regulators have approved. The Churches' Mutual Credit Union Ltd. was authorised by the Prudential Regulation Authority on December 16 will open for business in February 2015. 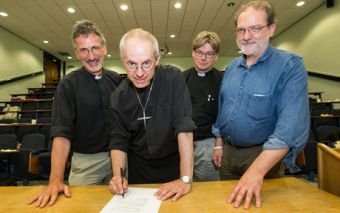 It is an ecumenical venture involving the Church of England (Anglican), the Church of Scotland (Presbyterian), The Methodist Church of Great Britain, the Church in Wales (Anglican) and the Scottish Episcopal Church (Anglican), the churches announced. "'Our faith in Christ calls us to love the poor and vulnerable with our actions," said the Archbishop of Canterbury, Justin Welby, who once worked in in the banking and oil sector. He was quoted on the Church of England website. "That is why the Church must be actively involved in supporting the development of real lending alternatives, such as credit unions. This is not an optional activity, but a fundamental part of our witness and service to all God's people. "It is also a chance for us all to redevelop and stimulate local, relational forms of banking focussed on serving the whole community," he said. At first, churches and individuals (notably ordained ministers, licensed lay ministers, elders, employees and trustees of churches and church charities and the charities themselves) will be eligible for CMCU membership, the Church of England said. A credit union is similar to a bank, but unlike a normal commercial bank it is run and owned by its members and serves the community rather than working purely for profit. Profits are not returned to a separate group of shareholders but used to benefit the members directly, with improved rates of interest for savers and borrowers. It is estimated that at least 60,000 individuals plus churches and church charities will be eligible to join the CMCU. "It will support and strengthen the credit union movement and contribute to the rebuilding of the mutual sector as a viable, ethical alternative to mainstream banking for people irrespective of their financial status," said the church statement. "Once the credit union has built up an established track record it is intended that CMCU will be open to all church members and extend its denominational base." Expanding the membership will require permission from the regulators to alter CMCU's common bond (the definition of those eligible for membership). The CMCU project began in 2008. The Church of Scotland established an economic purposes commission in 2010 to look into what had gone wrong with the country's economic system and to suggest how it might be improved. It set as its principle task to establish how the Church could "best offer Scottish society a new vision of what might be achievable in the economic, social and community life of the nation," said Rev. Sally Foster-Fulton, convener of the Church of Scotland's Church and Society Council.